Ratatouille…the gift that keeps on giving! We still had a ton of veggies leftover from Sunday’s feast…mushrooms, zucchini, squash, shallots, etc…and a bit of ground beef and goat cheese from Mark’s filet mignon, SO when I was at the lower Queen Anne Safeway this evening, I was really trying to come up with a meal that could incorporate what I had at home. We both agreed that we wanted something on the lighter side (which instantly ruled out our “go to”… pasta) so as I walked produce land, I ran right into 10 for $10 Assorted Bell Peppers. 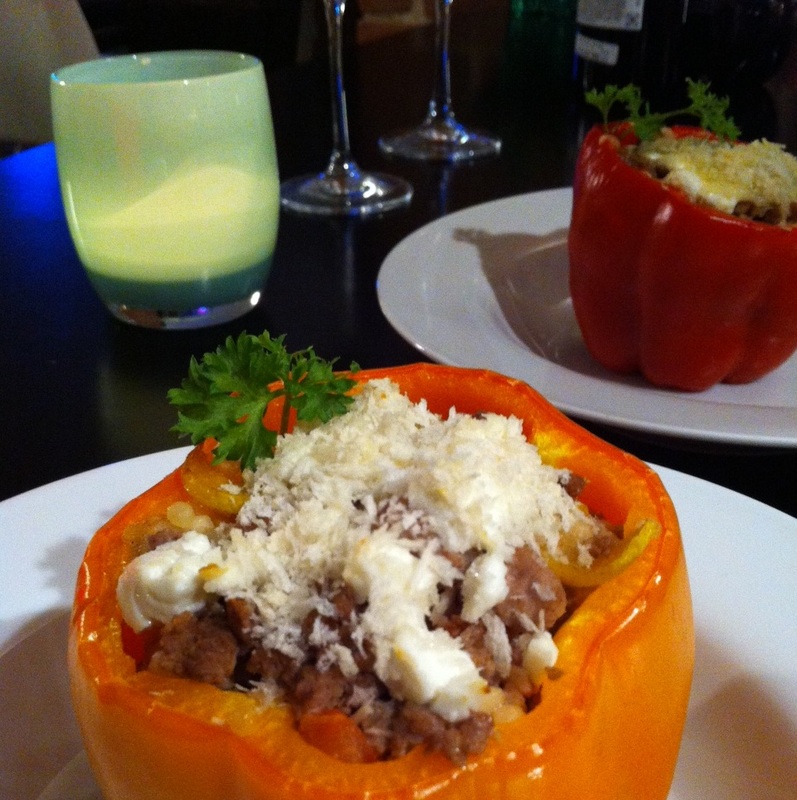 BINGO- Stuffed Bell Peppers! 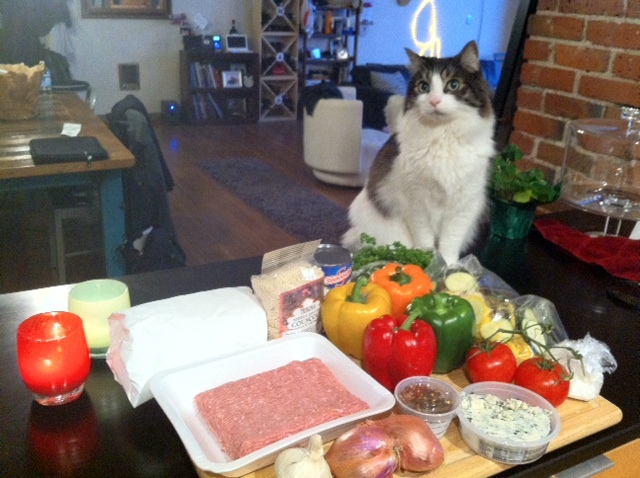 Jack, guarding the ingredients...he washed his hands. On my way home, stuck in 2nd Avenue traffic, I started second guessing the rice. I really wanted to use the leftover chevre and for some reason the rice just felt a little heavy. While I was researching, I did find a great recipe that used couscous so I dropped by Paris Grocery and bought some couscous along with Smoked Red Pepper Sea Salt- a perfect spice for tonight’s meal! Gut the bell peppers (removing the tops and seeds) and arrange them on a prepared baking dish (I used cooking spray). 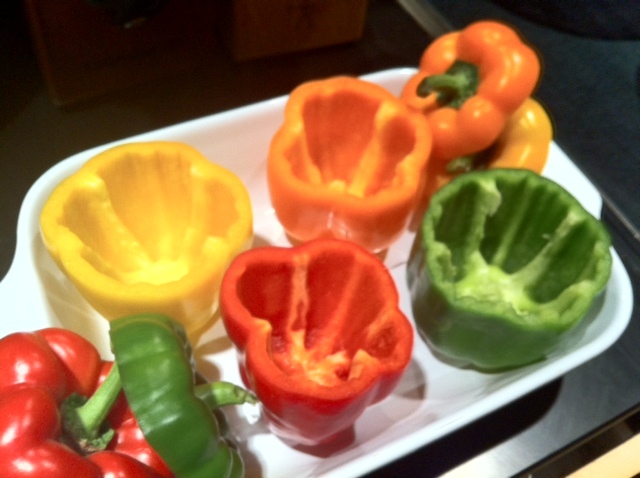 Pop them in the oven for about 15-20 minutes until they start to soften (you will see wrinkles on the side of the peppers), remove and set aside. In a saucepan, bring the chicken stock to a boil and then add the 2/3 cup couscous. Let it sit on high heat for 1 minute and then cover the pan and remove from heat. Let the couscous sit for about 10-15 minutes, covered. Meanwhile, on medium to high heat combine your beef, turkey, 1-2 garlic cloves, sea salt, red pepper flakes, cumin and black pepper. Brown the beef/turkey and drain excess oil. Set aside. Heat olive oil in large skillet and add the shallot, remaining garlic, zucchini, squash and mushrooms. Stir continuously for about 5 minutes (until the veggies are soft) and then reduce the heat. If you think you might need more oil, just use chicken stock! Add the tomato, stir for 1 minute and turn off heat. 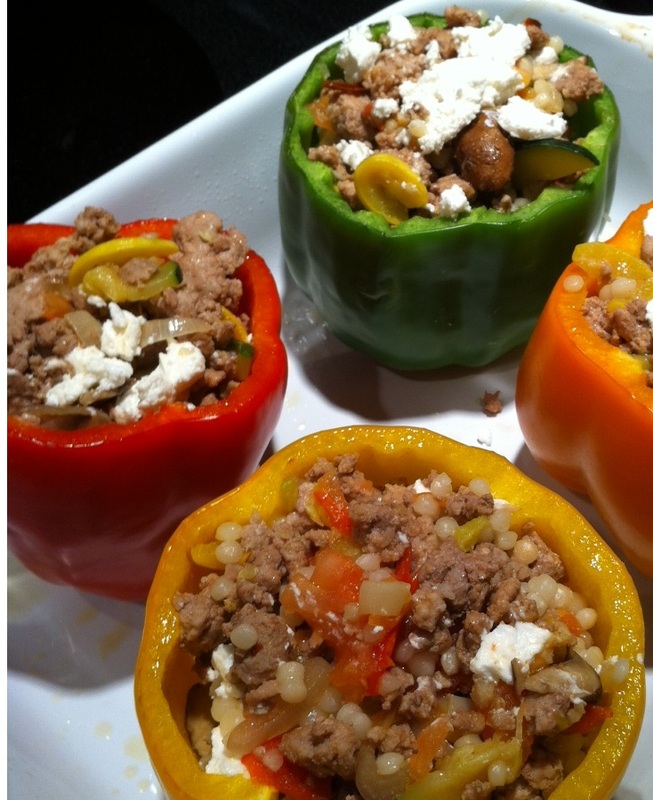 Add the beef/turkey and couscous to the veggies and mix. Just before stuffing the peppers, crumble about 1/2 cup of the chevre on top of the mixture. 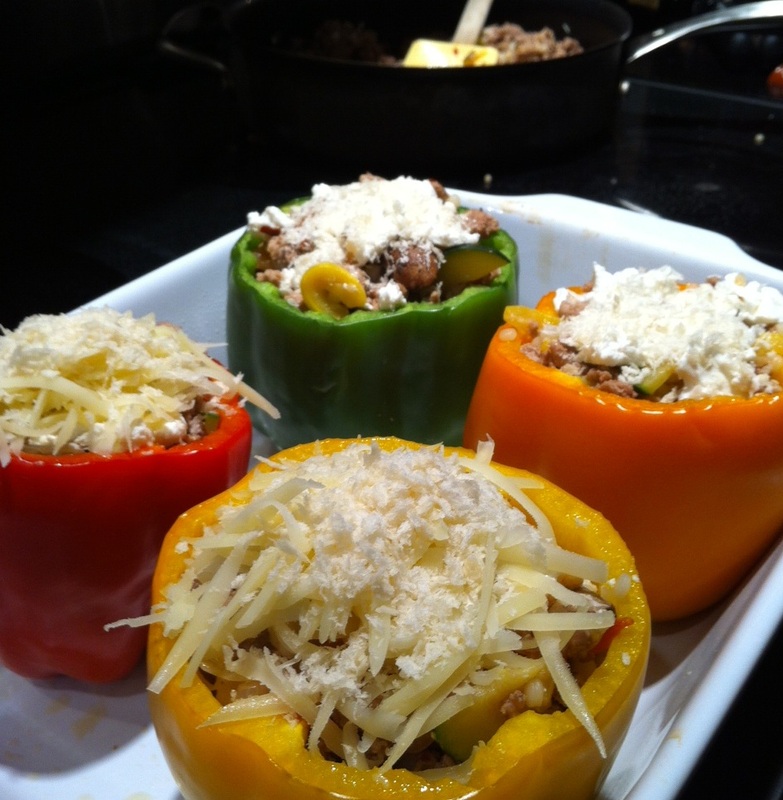 Fill the peppers completely with the mixture, top with the remaining chevre and a layer of Panko bread crumbs. Pop them back in the oven for about 15-20 minutes and enjoy immediately!